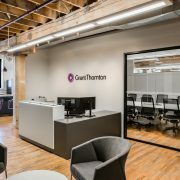 As part of its continued commitment to ‘quality without question,’ Grant Thornton LLP has named three executives to the firm’s Audit Quality Advisory Council. The three-person council now includes two independent members – Chris Mandaleris and Ann Yerger – and Grant Thornton Partnership Board member Seth Siegel. As advisers to Grant Thornton’s Partnership Board, the council will provide deep, practical and objective advice regarding ways Grant Thornton can continue to deliver high audit quality. In so doing, this council will champion the audit profession and its role in supporting the trustworthiness of our public markets. Mandaleris, a retired Ernst & Young LLP Audit partner, joins the Audit Quality Advisory Council after having spent 25 years working in EY’s Audit practice and having helped open the firm’s Greensboro, North Carolina office. Most recently, he was the senior deputy director in the Public Company Accounting Oversight Board’s (PCAOB) inspections division. After 13 years with the PCAOB, Mandaleris retired in 2016 and dedicated his time to serving the Greek Orthodox Church in the southeast as a volunteer strategy, governance and internal control advisor. He is a certified public accountant (CPA) in Alabama and a member of the American Institute of Certified Public Accountants (AICPA). Yerger joins Grant Thornton’s council after spending the past 20 years at the Council of Institutional Investors, where she served as the executive director. She has also served as the executive director of EY’s Center for Board Matters, as a member of the PCAOB’s Investor Advisory Group, and as a member of the SEC’s Investor Advisory Committee. She also served on the U.S. Treasury Department’s Advisory Committee on the Auditing Profession. Yerger is currently a member of Spencer Stuart’s North American Board Practices and is an independent director of Hershey Entertainment and Resorts Company, where she chairs the nominating and governance committee and serves as a member of its compensation committee. Siegel, who serves as an Audit partner and as Grant Thornton’s Florida Audit practice leader, will function as the council’s Partnership Board representative. He joined the firm in 1996 and has more than 20 years of public accounting and corporate finance experience. He provides services to both publicly-traded and privately-held entities with a focus on companies in a variety of industries, including financial services, private equity, real estate, hospitality and energy. Siegel is a CPA in Florida and a member of the Florida Institute of CPAs and the AICPA. Founded in Chicago in 1924, Grant Thornton LLP (Grant Thornton) is the U.S. member firm of Grant Thornton International Ltd, one of the world’s leading organisations of independent audit, tax and advisory firms. Grant Thornton, which has revenues in excess of $1.8 billion and operates 58 offices, works with a broad range of dynamic publicly and privately held companies, government agencies, financial institutions, and civic and religious organisations.